The Third Kingsland Irregulars: Where is the good news? Where is the good news? A better question would be, why does only bad news sell. An even better question would be does only bad news sell?I'm not going to argue against the need for bad news, we need to know when public servants or politicians are lying*. We need to be aware of trends in the greater world - i.e. climate change. The good news always seems to be fluffy and borderline meaningless. Or about sports. So the things that take the headlines are primarily bad things. One possibility that is trotted out often enough is that it's the bad news that sells. And it obviously does. The counterpart to that argument though is that good news doesn't sell. I've been watching a cooking programme called River Cottage - this particular series of River Cottage is all vegetarian. An observation was made that there was and had only ever been only one vegetarian dish on the main menu because that's what the market wanted. Which immediately raised a logical fallacy type flag in head, how do you know that's what the market wants if that's all you've ever offered them? 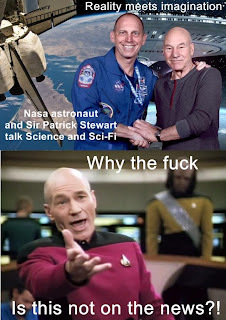 Not news in and off itself maybe, but we had William Shatner talking to one of the astronauts on the space station recently. How about an ongoing theme through our media for a couple of weeks about space exploration and the plans currently being made to bring asteroids into moon orbit so as to be able to mine them? Something for the public to be inspired by? It occurs to me, as I write this that the primary problem with reporting good news, might very well be that it's more expensive that reporting bad news. Bad news happens right in front of your face. Good news has to be sought out. And it requires retaining well trained and specialised journalists. I will admit there is a possibility that there is good news in the news - a lot of it science related, which I don't see as good news because it's so poorly reported. It also occurs to me that I may have made a related argument once before with respect to the need for grandiose projects. Things to inspire people, to get them talking. We still need to talk about all the bad stuff, it'd be nice though to have some larger, positive themes running through our public discourse. *No, politicians do not lie all the time. Some of them are devoted to some pretty stupid, fundamentally detached from reality type policies, but I don't doubt that large numbers of our current National government are in politics because they think they are doing the right thing - reality be damned.